Pretty copper homeware in metallic and gold tones are still a hot trend, often alongside a marble background. I’m a bit late to the whole thing, but luckily Red Candy have come to my rescue and now I have officially jumped on the bandwagon. 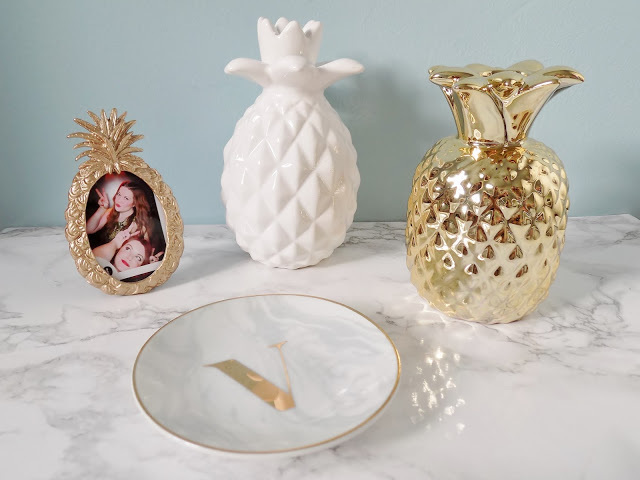 And I’m not ashamed to confess my new love for copper homeware accessories and pineapples! 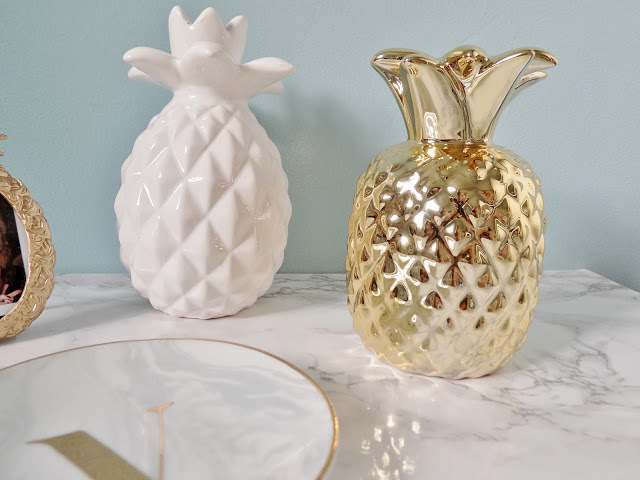 Possibly my favourite new addition is this tropical gold pineapple, which is actually a candle holder that would probably hold a tealight, but I’ve been using it purely for aesthetic purposes! It’s the perfect size to sit on a dressing table or desk, and I love the really glossy gold. It would make a lovely addition to a bedroom, living room, or in my case, dressing room. I also managed to find a plain white ceramic one in Poundland (bargain! ), so now I have a lovely little pair of pineapples. It also matches perfectly with my mini Sass & Belle pineapple photo frame! Geometric shapes are another current big trend, and this copper photo frame by Umbra ticks all my boxes! I love the 3D prism shaped construction and the simple yet striking design. 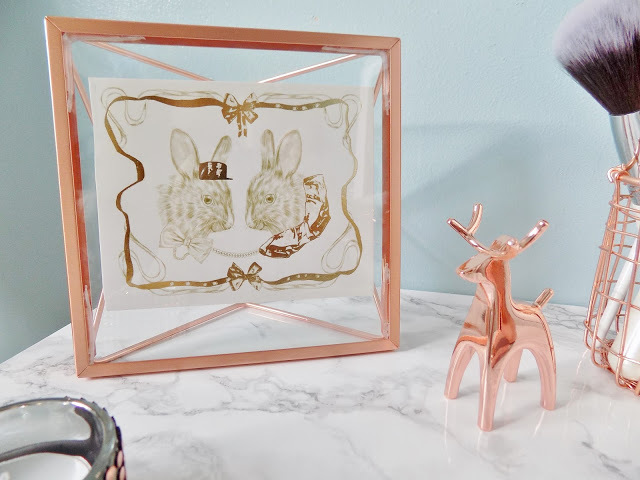 The frame can either be wall-mounted or stood up on a table, and I think it looks perfect alongside other copper home accessories. It is available in various sizes but I picked the smallest one which fits a square (hello Instagram!) 4×4 inch photo. I don’t really have any recent printed photos to hand at the moment (who actually gets photos printed these days?!) so instead I have just put this gold bunny picture in that I think was actually once a H&M gift card! 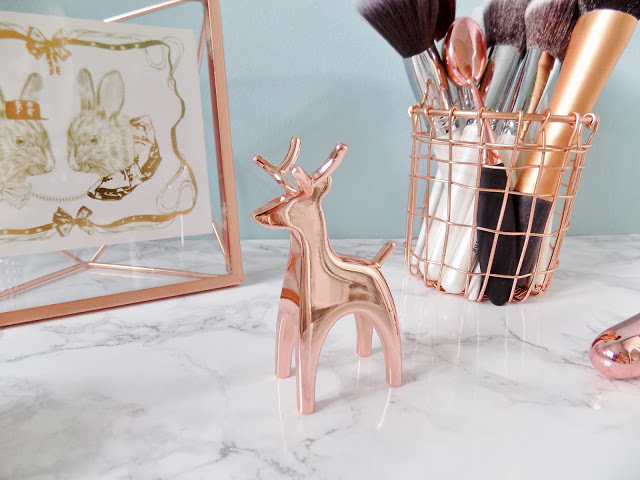 This metallic reindeer ring holder not only makes a cute little decoration, but he’s actually quite useful too! 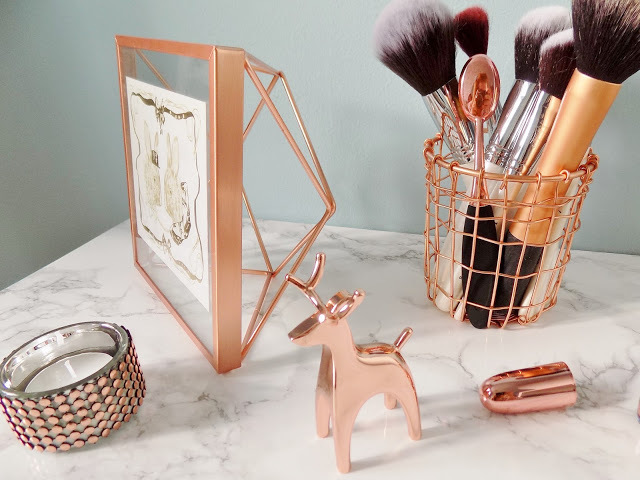 You can use either his antlers or tail to keep your rings safe, or I might just keep him as a little desk or bedside table pal. He is very sleek and shiny and finished in the same gorgeous copper shade as the frame. This reindeer would make a great little gift, and there are other animal designs available too! And the final latest addition to my copper homeware collection is this stunning copper wire pencil cup designed by Cabo. 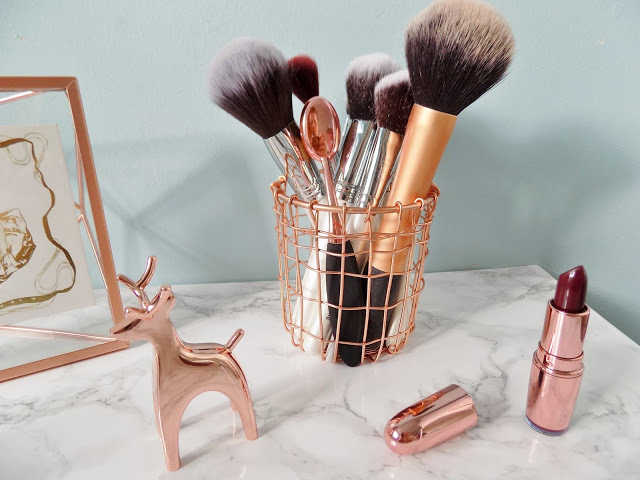 I’ve decided to use it as a make up brush holder in my dressing room, and it really does look pretty and quite Instagram-worthy sitting on the marble background. If you decided to use it as a pencil pot on your desk, you can also buy the matching office accessories including a letter rack, basket, and waste paper bin! The only thing to bear in mind though is that the gaps between the wire are quite big, so sometimes a pencil or thin stemmed brush might slip through! 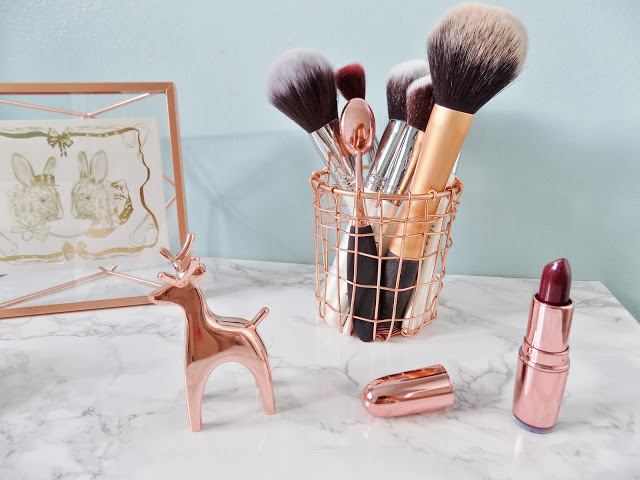 Do you love copper homeware accessories? I adore the rose gold/copper trend, they make everything look ten times prettier! that pineapple is so cute!